Sitting in the living room of her new home just outside of Baltimore, bestselling author Jill Smokler glances out the floor-to-ceiling windows at her lush backyard — her personal oasis, complete with a patio, hammock and pool – the part of the home she fell in love with first. What seems to be a picture-perfect home didn’t come easy for Smokler. It was the culminating new chapter in the life of the best-selling author who, in 2008, begot the popular “Scary Mommy” blog — which she has since sold — about the highs and woes of parenting. After her divorce from her husband, who revealed he was gay in 2017, Smokler wanted a fresh start. She put what she once believed was her forever home in New Hampshire on the market, had an estate sale, and searched for a new home. 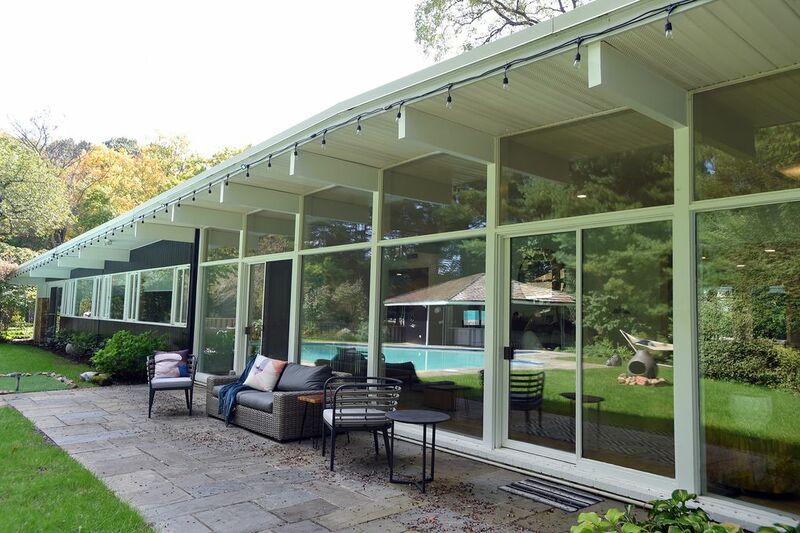 “I wanted to find a house that was the polar opposite of anything I ever lived in before, and this was pretty much it,” Smokler said of her one-level midcentury pad. She let go of her need to have multiple levels and traded in the big rooms and grand ceilings of her previous home. 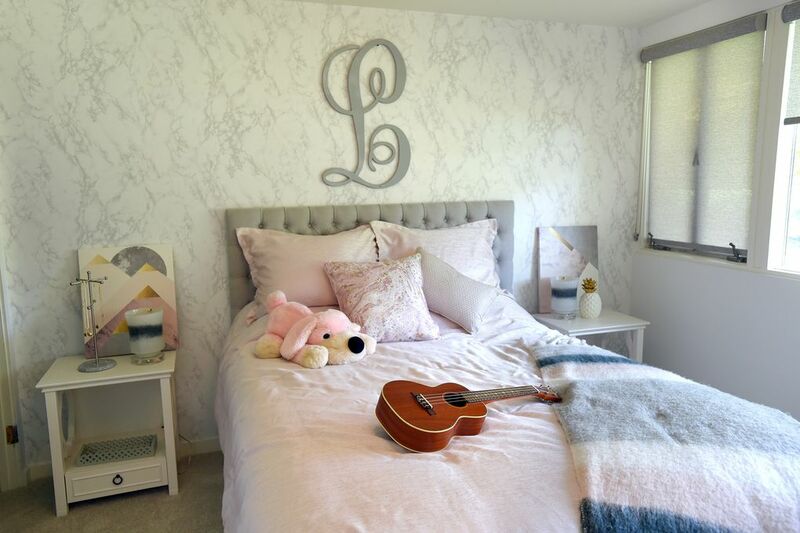 The 3,800-square-foot house symbolizes the next stage of her life, in which she hopes to continue some of the candidness that she’s been known for during the past decade, but this time as a single, dating mother of tweens and a teen. The writer, who started the blog in 2008 to chronicle her life as a stay-at-home mom, sold the company, officially leaving last spring (2018), in hopes of creating a cozier platform where she gets to talk about her new experiences as a 40-year-old dating divorcee. Smokler bought the home on Nov. 1, 2017, (a day after Halloween, since she was superstitious). Renovations began shortly after in December, taking around eight months, which was especially grueling since Smokler and her children — Evan, 11; Ben, 13 and Lily, 15 — had already moved in. The home looked like it was straight out of an ’80s film, covered in floral wallpaper that coordinated with toilet seat covers, bedding and pillows. It was more than she could take. She designed the renovations herself; contractors did the grunt work. There was the stripping of window treatments, curtains, valances and mahogany wood floors, which she had lightened. The home’s entire electrical system had to be redone. A major load-bearing wall had to be knocked down in order for Smokler to open up the kitchen in the way she envisioned, and bathrooms, each with pastel toilet bowls, had to be renovated. The family was also without a kitchen for four months — which meant many nights of pizza, sandwiches and Kraft Easy Mac. Smokler also recalled resorting to making food in the bathroom, using a crockpot to make pot roast. “I came out with this platter of pot roast, and my daughter said, ‘If you think I’m eating that, when it came from there, you are so wrong,’ ” Smokler laughed. They ordered pizza that night. Needless to say, the home took some getting used to, and “In retrospect, I would not recommend gutting a house while living in it, especially with three kids,” said Smokler, adding that it wasn’t her best decision. Next time, she’ll take baby steps, but the end result was a huge payoff. 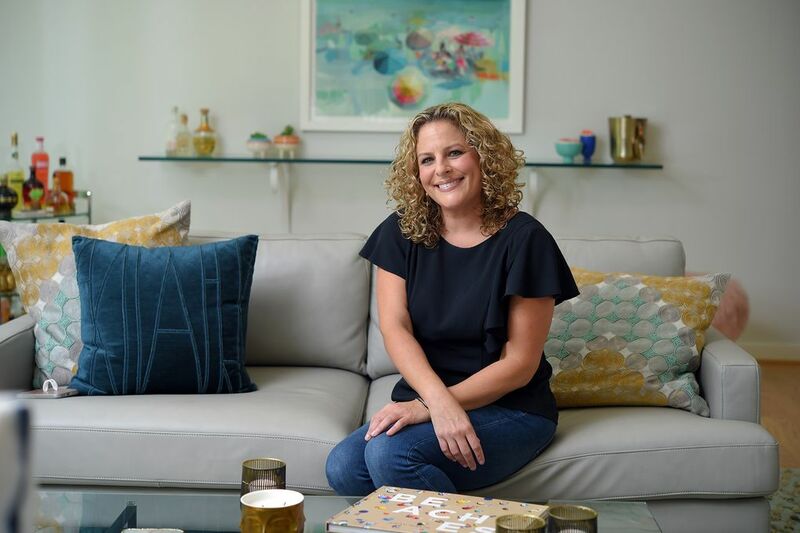 Her new spacious home has four bedrooms, an office, a kids lounge area, a den and four bathrooms — decorated with a mix of décor purchased from consignment shops, HomeGoods and Target. The children’s game room and living space is unmistakably primed for fun, with a vintage “Indiana Jones” pinball machine, baskets filled with Nerf guns and comfy seating, including a large L-shaped couch. Their individual rooms are tailored to their tastes — Smokler’s room is the most colorful, with a hot pink wall. Ben’s room, though a random assortment of books and toys, features skateboard bedding. 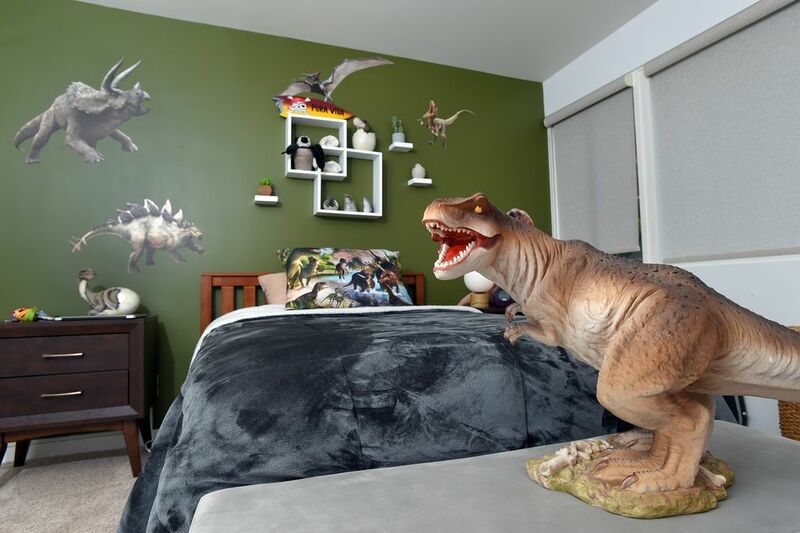 Evan has a dinosaur theme (Smokler admits she might have gone overboard with the decals), and Lily, a theme of grays and pinks with marbled wallpaper — a scheme Smokler originally wanted for herself. 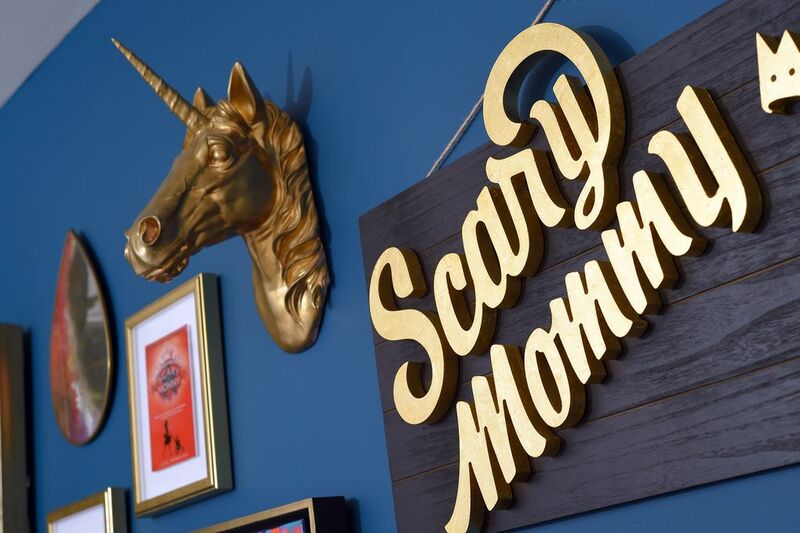 The office, a neat space with a dark blue wall, features artwork and homages to Smokler’s past life, with a “Scary Mommy” pinboard and photos of friends and celebrities, including Queen Latifa. A hallway, which leads to the den and bedrooms, is filled with artwork of airplanes that her father used to have in his room as a child. The den features new carpet, a leather couch and mahogany woods. The living room, with its light hardwood floors, is Smokler’s favorite room. A gray backdrop comes alive with splashes of color from artwork and a corner bar stocked with pretty liquor bottles she picked out for aesthetics alone. A clear spherical chair hangs suspended from the ceiling. It’s reminiscent of Anthropologie, the apparel, furniture and accessories store where Smokler once worked in visual merchandising. “I sort of looked at the different sections of the house as little vignettes like how I used to decorate things at the store,” she said. The decorating process is much different as a single woman, she noted. And even though she’d go about an entire home renovation in a different way next time, she’s pleased with the outcome.